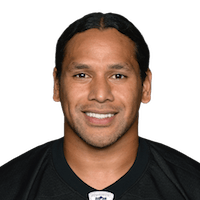 Published: Oct. 20, 2014 at 11:22 p.m.
Pittsburgh Steelers safety Mike Mitchell forces a fumble against Houston Texans wide receiver DeAndre Hopkins and safety Troy Polamalu scoops it up and returns it 13 yards. Published: Aug. 21, 2014 at 10:50 p.m.
Philadelphia Eagles quarterback Nick Foles throws an interception to Pittsburgh Steelers safety Troy Polamalu. Published: Dec. 23, 2013 at 06:42 a.m.
(2:00) (Shotgun) M.Flynn left end to GB 17 for 7 yards (T.Polamalu). FUMBLES (T.Polamalu), RECOVERED by PIT-B.Keisel at GB 17. B.Keisel to GB 17 for no gain (J.Kuhn). Penalty on GB-D.Bakhtiari, Offensive Holding, declined. Published: Dec. 22, 2013 at 08:40 p.m.
Pittsburgh Steelers safety Troy Polamalu jars the ball free from Green Bay Packers quarterback Matt Flynn, and the fumble is recovered by defensive end Brett Keisel.